Victor Margolin was up next. Writer of numerous books, and he did focus on sustainability, and very directly. As I started writing this, it was hovering around 39˚C here in Sydney. Gusty, burning hot air. Too hot. It could not have been more different to New York, where I'd been a week or so earlier, where the temperature had been hovering around -7˚C and down to -15˚C with the windchill. 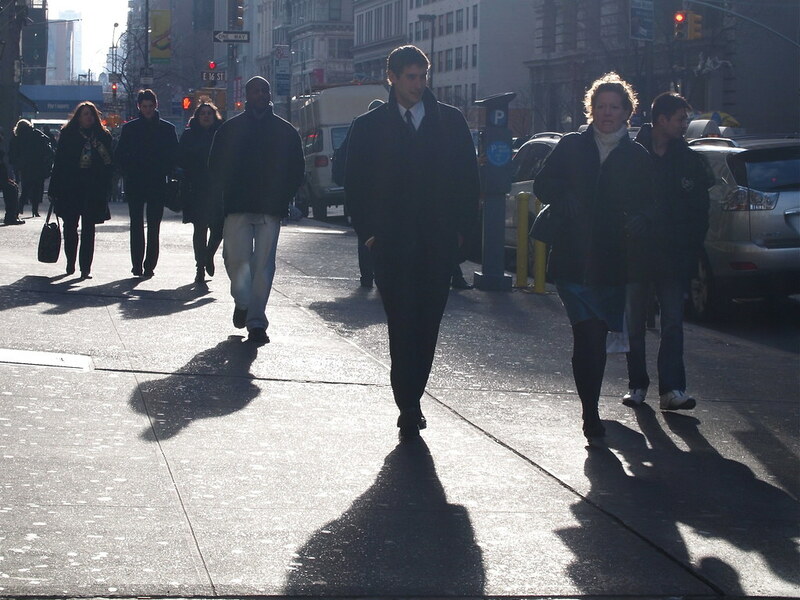 I was in Manhattan for a Microsoft Research event: their annual 'social computing symposium', and this year was loosely focused on 'the city'. Many thanks to Tom Coates + Matt Jones, Liz Lawley, Clay Shirky et al for the invite. Here are my notes on the event, with a dash of local colour thrown in for good measure. File under 'better late than never'. NB: This is a write-up of a talk that took place at Postopolis! LA during April 2009. Notes are taken in real-time, with editing and context added afterward so reader beware. All Postopolis! LA entries are gathered here. An editor at Archinect, and a recent grad from Harvard GSD, Boyer now notes that “he works for Finland”, essentially, as he’s now employed at Sitra, the Finnish Innovation Fund. Bryan’s pulled off a real coup here. He’s only invited the Deputy-Chief of Counter-Terrorism and Criminal Intelligence Bureau for the LAPD to speak at Postopolis LA. (Later that year, Downing would become interim Chief of Police). Clem Jones seemed like a decent man. A dedicated republican and Labor party stalwart, he died aged 89 on Saturday 15th December 2007. The press are widely crediting him with 'building Brisbane', which is now the fastest-growing city in Australia and the 'Third Metropolis' finally forcing the traditional cultural capitols of Sydney and Melbourne to sit up and take notice. Queensland Premier Anna Bligh says Jones was "the father of modern Brisbane ... his lifelong civic contribution and love of the city of Brisbane was unsurpassed ... Clem will long be remembered for his vision and commitment to transforming Brisbane from a conservative country town to a vibrant and cosmopolitan city." Local boy and new Australian Prime Minister Kevin Rudd - another sign of Brisbane's currently rising star - said "Clem was a longstanding personal friend of mine, a great source of support and encouragement and friendship." He may well have been the key catalyst in transforming Brisbane in the latter part of the twentieth century. The city is increasingly unrecognisable to that described by those who saw it in the '70s and '80s. Wealthy from numerous sources, a strong hi-technology-oriented industrial base, with an increasingly well-respected university and research sector, the best new art gallery and library in Australia and currently the country's most innovative architecture scene, a wonderful sub-tropical climate and handy for the jaw-dropping Queensland coast, increasingly good restaurants and fabulous local produce, a tree-covered hilly topography on which the extremely liveable suburbs sit, and with the distinctly Asian aspect that most Australian cities should have. There is still a residual sense of the earlier Brisbane in the culture, of course, as these things take generations to shift (more on this later). The city had to come a long way too, from the frankly unbelievable Joh Bjelke-Petersen years. But the character is now orientated towards an educated, cultured, outward-looking and sophisticated city - a world away from the 'Brisvegas' that the out-of-touch in Sydney and Melbourne would still tag the city with, albeit with an increasingly insecure note in their voice. Jones, as lord mayor for 14 years from 1961, pulled the city's socks up and set the scene for all of this. 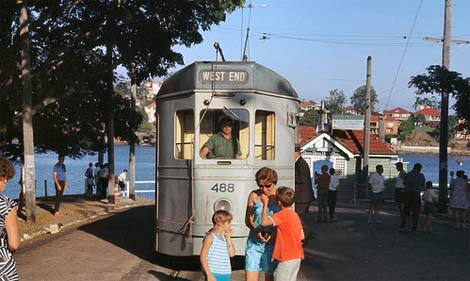 But along the way Clem Jones was also the man who pulled the trams out of Brisbane in 1969. 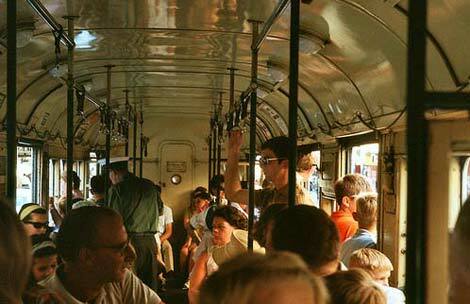 By all accounts, no-one was particularly happy that last day of the trams, except a few of the traffic engineers. 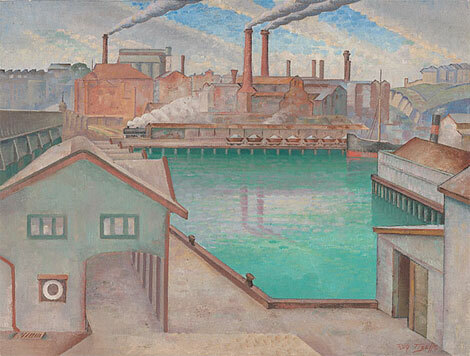 As a replacement, Jones and his administration embarked on the vast road-building schemes that now define the modern Australian city, and all to no avail. Brisbane is horribly clogged with car traffic, no matter what. Just as Sydney is. And that, perhaps more than anything, holds both cities back from fully realising their modern vision. Jan Gehl's recently announced plan for Sydney's centre is not without its flaws - listen to his lecture from September to see where it comes from - but a pretty close version of it needs to be implemented in Sydney, and Brisbane should do likewise, though spreading the ambit of the plan over the sprawling city's outer suburbs. That's such a beautiful evocation of the city's form that it seems churlish to wonder how many people today, a generation later, would sense those radial opposites. Malouf's imagery is so strong that it would defy simple quantitative measurement, and by repeating it here I'm hopefully reinforcing the image one more time. However, today's Brisbane has very visible swollen arteries - principally Coronation Drive into Riverside Expressway, and the ICB (Inner-City Bypass) - rather than invisible principles, and they appear to do little to hold it together. Jones did what he thought was necessary - albeit advised by American planners, apparently. Certainly, someone had to lift Brisbane into the post-war period. Before Jones, many of Brisbane's roads "even those just a kilometre from the GPO", reports The Australian, breathlessly - were "uncurbed and unsurfaced dirt". Admittedly the dirt roads weren't tenable and Jones's administration sorted all of that. 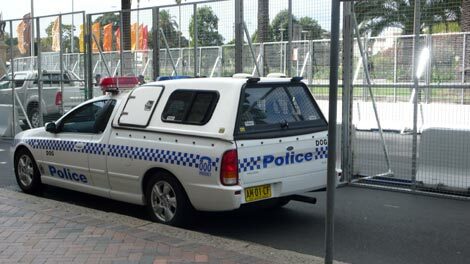 But in doing so, it fully orientated the city towards the car. There's an in-built prejudice against public transport around this. Jones was quoted as saying that his ideal was for the working man to be driving his own car, not catching a tram. This is where Australia looked to American values rather Mittel European or Asian, and for the worse. There are clearly spatial similarities between Australian and American cities, but I'm yet to perceive the swing back towards public transport seen across the US west coast, from the Bay Area up to Portland and Seattle (never mind New York City, which might be a special case). It's not a party political issue either; Jones was solid Labor, though his sentiment was close to Margaret Thatcher's infamous statement: "Any man who rides a bus to work after the age of 30 can count himself a failure in life." Hear we see not only Thatcher's near-psychotic levels of misanthropy but also, crucially, her lack of long-term strategic vision. The question now is, at what point will we be saying "any man who doesn't ride a bus won't be getting to work". Jones was far less destructive than Thatcher but either way, an entire car-centric infrastructure will now have to be taken apart, bit by bit, and reconstructed with mass-transit systems in the ascendancy. As with Sydney, that realisation is not widespread yet, and the culture is so ingrained as to actually prevent people from thinking there could be another way. The dramatic flourish in Gehl's plan for Sydney, pulling down the Cahill Expressway across Circular Quay, is described by the Sydney Morning Herald's urban affairs editor as overly "drastic and impossible". Frankly, that's the unconsciously defeatist talk of someone who's spent too long in their city's skin, and can't think the the unthinkable. Equally, in Brisbane, it seems people can't think of another solution to near-fatal levels of individual car traffic than building more roads. Listening to Gehl's talk, they'd hear that building more roads only leads to more traffic, a pattern we've seen many times over. Almost every day in the local rag, the Courier Mail, you'll read of a simple unfortunate accident causing hours of chaos throughout a system organically interconnected through necessity rather than strategy. 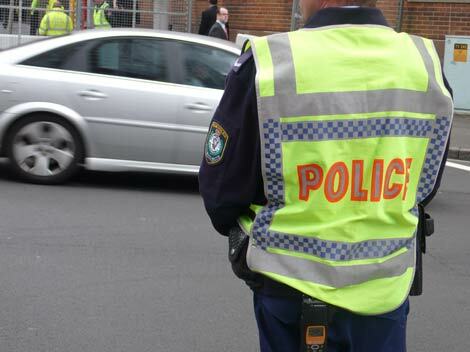 They even have a 'Stop the carnage' campaign, due to the increasing number of road deaths on Queensland's roads. These are all symptoms of the same spiralling metastasis you see when systems run at overload (see also Heathrow, the world's worst airport). Yet the solution offered up - despite the carnage, even - is usually tunnels, bypasses, bridges, while rail and bus services suffer from the bad management often seen when implicitly deprioritised. Sadly, the shrill new urbanist agenda doesn't help change people's views that often. It's overly orientated towards the pedestrian, and needs to find a way of handling moderate levels of private car traffic as well as mass transit and pedestrianisation. 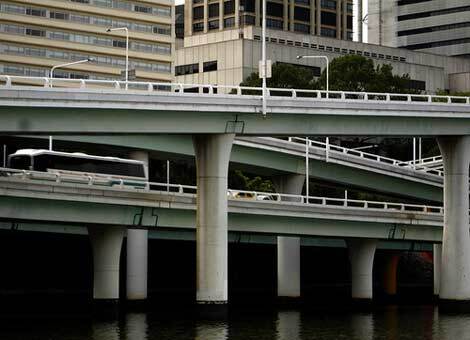 Equally, some of those elevated road systems can be amongst the most thrilling aspects of modern cities, particularly Brisbane's Riverside Expressway (section pictured top), which is virtually a big-dipper casually sweeping out over the river. It's going to take far more imaginative campaigns than we've seen thus far - it's a hegemonic battle, ultimately - alongside serious build around mass transit systems and related infrastructure, hard and soft. And even then the strongest clear message will probably be peak oil. "The size of a city determines its need for a metro system. Cities of a few million people—or those anticipating huge population growth—really can't do without a mass transit system. But cities of one or two million inhabitants can choose between a subway and a surface tramway, which costs far less but also runs more slowly." But I'm not sure it's that well understood - simply a case of choosing between subway or tramway. 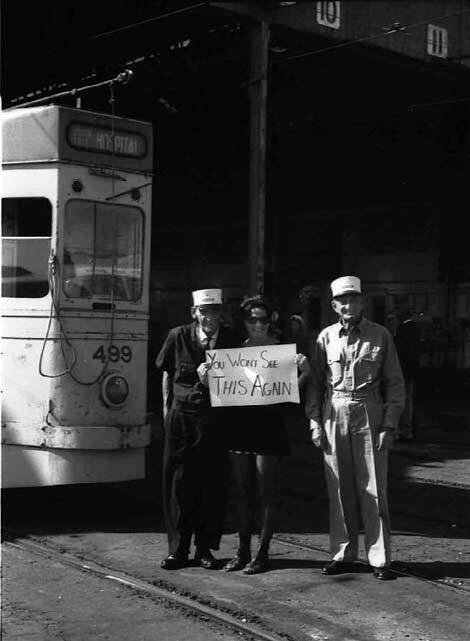 Of course, there are now plans to for the trams to return to the 1.8m strong Brisbane (the person holding that 'you won't see this again' sign in 1969 was wrong), along with bus systems weaving underground and around the centre. Bike lanes are emerging, albeit threaded through some of the busiest and most dangerous roads in the country. These are usually seen in addition to road-schemes, rather than as progressive replacement. So it's a start, but hearing the currents in everyday conversation in this city, people have yet to understand the scale of change required to the city, that quite shocking sense of dismantling the entire infrastructure. It's too simplistic to blame Jones or his administration - as a New World city boss of the 1950s and 1960s, almost anyone would have seen cars as a first order object to organise around. Only the already dense cities of the Old World were fortunate enough to have the right form for mass transit (even then Paris, New York, London, Boston, Barcelona et al did their best to slice their fabric apart with roadways, turning their backs on rivers or harbours, only to have to now re-build.) 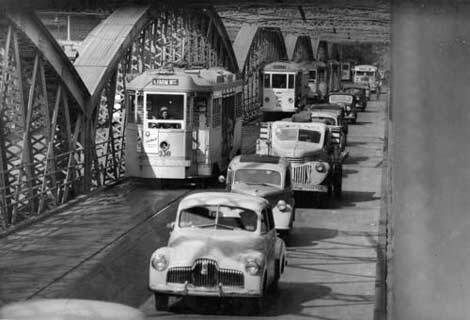 Yet even with a shift towards private ownership of cars, there was no real reason, strategic or economic, to pull the trams and light rail systems out of cities, and certainly no need to go as far as Jones or Thatcher suggested. So. Brisbane is potentially beautiful and Clem Jones seemed like a good man. He helped shaped what's emerging as a great city, and now is not the time to speak ill of his generally valuable work. Yet it's symptomatic of the lack of understanding of the ills of the modern Australian city that few people are pointing out the flaws in building Brisbane around the car. 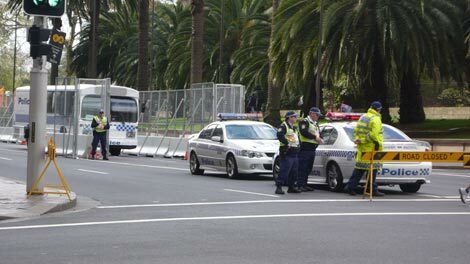 The APEC summit is in town, and Sydney is on full-alert. At least as much as Sydney is ever going to be. 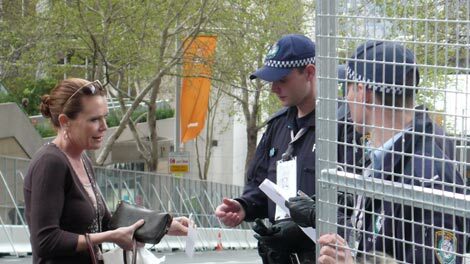 The leaders of the Asia-Pacific Economic Co-operation forum have more or less brought downtown to a standstill. Drawn from nations representing over 60% of the global GDP, featuring the premiers of the USA, China, Japan, Russia, South Korea, Australia and many others, it's the most powerful international assembly ever in Australia. To some APEC appears to be little more than a talking shop, and others have grumbled about the upheaval the event is causing. 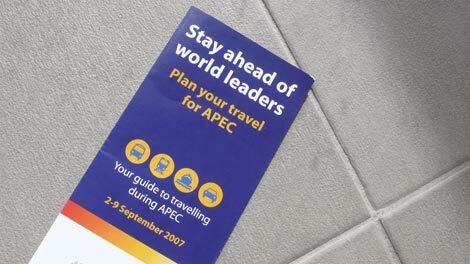 But former Australian PM, the brilliantly outspoken Paul Keating, who provided much of the impetus for APEC in its early days, essentially says that the city should be proud APEC is here, and deal with it. (I agree with him, for what it's worth, and despite what I write below.) Keating intriguingly goes on to suggest that "one of the greatest pieces of software that Australia developed in the 1980s and mid-1990s was foreign policy", describing APEC as an artifact of that, and suggesting what the forum should really be about, particularly for Australia. Meanwhile Sydney is just agog that Vladimir Putin is here, Shinzo Abe is here, Hu Jintao is here. George Bush "arrived by water" - I love that phrase, as if he splashed up a beach in the dead of night, face blacked up, knife clenched between his teeth - a couple of days ago, and the local media are twittering about everything from his surf'n'turf'n'no-veg diet to his understanding on Iraq with current Australian PM John Howard. For Howard it may be one of the last things he does in office, but for Sydney it's a chance to play host at a glittering ball, and it's laid on its jewel, the Sydney Opera House, as the venue. Playing host these days, however, means less a spirit of welcoming, open embrace, than a total lockdown of the urban environment. 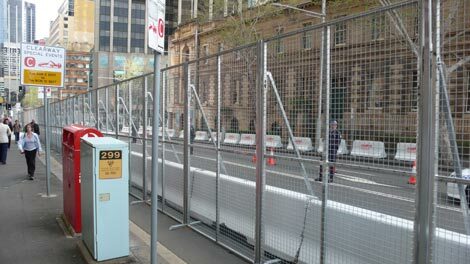 First up, read fellow Sydney-resident Marcus Trimble's excellent piece on what this has meant for the city's urban form, describing the extraordinary 5km fence that's been built around the Opera House area in the CBD, Sydney's new temporary (non-autonomous) zoning, and the informational security measures in place. "The message is very clear - there is nothing to see so please stay away." 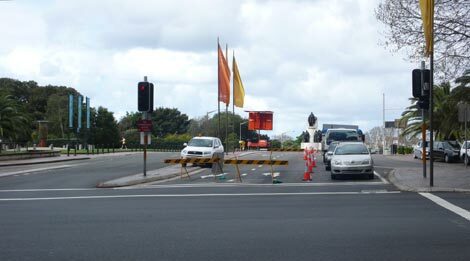 Actually, it is of course fascinating: I overhear people talking of going to actually see The Fence, as if it were a new temporary attraction, and when I visited on Wednesday, many Sydneysiders were just hanging out in the "sniper-ridden ring of steel", watching the whole circus. News sites are full of it, and Sydney has been radically altered for a few days. There is plenty to see. 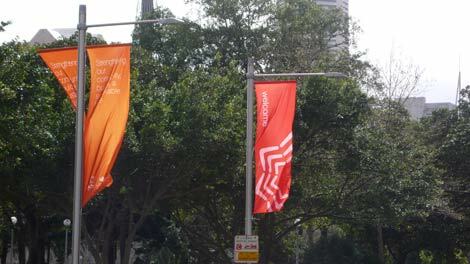 The city's lampposts are festooned with APEC banners, creating orange gates - a Christo fan somewhere? - and the place is largely devoid of traffic. In addition to the slightly desperate plea of Watkins above, today was declared a public holiday and the official literature actually suggested people leave the city for the weekend - and a somewhat inadvertent drive towards walking the city and taking public transport. 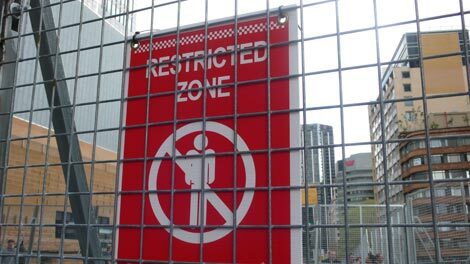 In the Sydney Morning Herald's special APEC section, John Huxley writes of prison language - 'lockdown' - and the Dead City that's left behind. I find the peculiar atmosphere a little reminiscent of the accidental pedestrianisation of London after the 7/7 bombings, though here cultivated through the power of nightmares rather than actual terror. 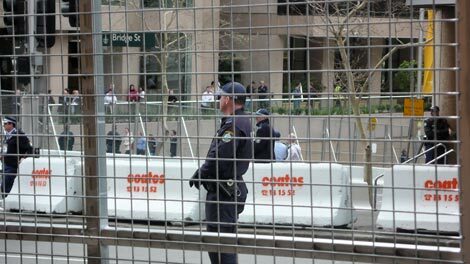 "The fence is ugly but is there to keep delegates and people of Sydney safe from public order problems and the threat of terrorism. These are the ugly realities of our world." His ugly realities perhaps. 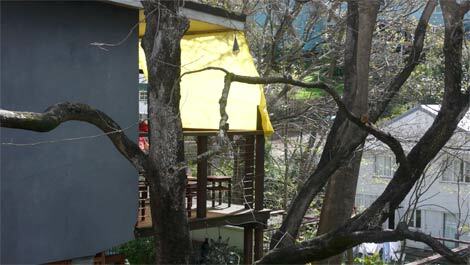 But from an architecture or urbanism perspective, it's ugly and interesting. In the spirit of Cedric Price or Archigram, you could see the entire fenced structure as one transient building - a kind of tentacular walking city, with its own streets and arteries, overlaid temporarily over the concrete city beneath, as if it's squatting on the CBD, attempting to suffocate or strangle, perhaps. I'd like to see a photograph or plan of The Fence from above, and then extrude its form from the streets (sketch below). Of course, it's the antithesis of what Price and Archigram attempted with their visionary work - a kind of Anti-Fun Palace, in which possibilities are diminished and the only course of action is to be shepherded out to the perimeter of the city. From an urban planning perspective, it's the opposite of creating a contemporary open space. You could see the whole thing as a design problem - perhaps run as an avant-garde exercise in a crazed design school somewhere: how to tighten the grip a very public space, centred around one of the country's principle attractions? 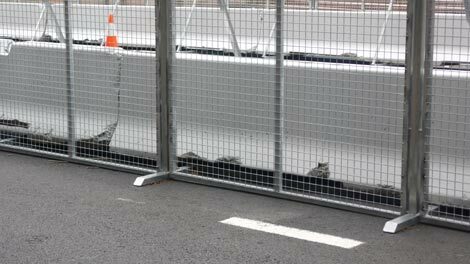 Again, you begin to look at The Fence as a temporary architectural incursion in the city, a reversal of the usual - or at least more written about - architectural and urban design work. You half wonder where The Fence is heading next. As Marcus points out, this design work now also include a tightening of the informational grip on the city, by deliberately eroding data services over strategic locations. 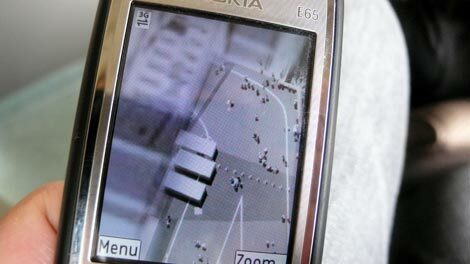 He describes as a "lo-fi-ing of Sydney, resolution as security measure", in which Google Earth/Maps high-resolution imagery of the Sydney CBD is subtracted, such that it becomes temporarily blurred over the Opera House and other related places. One speculates as to how that happened. (Of course, Google wouldn't want to be held responsible if anything terrible did happen, as will no doubt have been pointed out to them. Though it's a little ludicrous to suggest that their service offers the potential plotter anything over the many readily accessible, detailed paper maps of Sydney apparently still in existence.) It's also strange to note just how overly precise the blurring is. 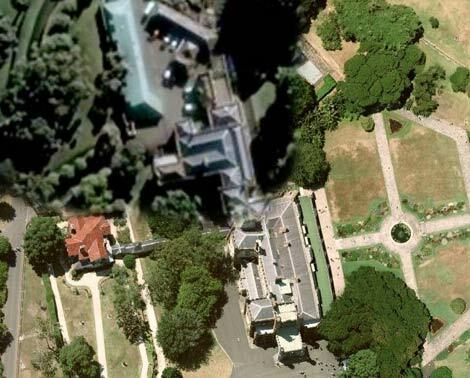 In this image below, of Google Maps on my phone taken on Wednesday, note how the edge of the Opera House (left) is the exact point at which the blurring/sharpening occurs. A curiously limited definition of the danger zone. It's an oddly crude tactic, and in terms of an analogue to the physical Fence, it's far less effective. 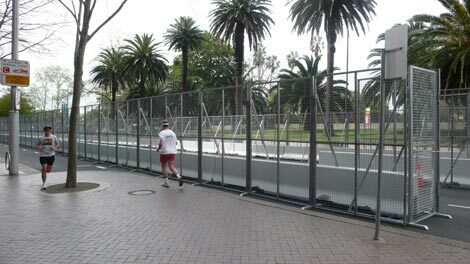 The Fence covers a huge area, across 5km, whereas this strategic blurring seems a little tokenistic. 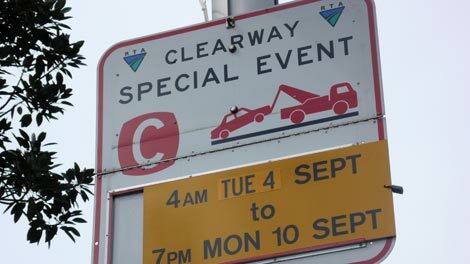 However, note also that this informational space extends to the media too, with ABC's satirical TV show The Chaser being warned off "trying anything" in the area. Of course, that didn't work [video]. 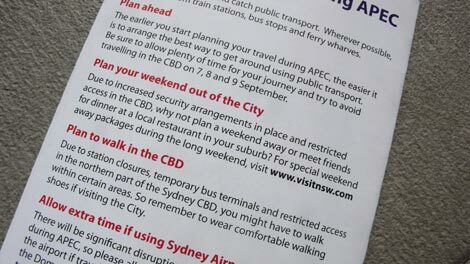 So, seeing its media as a part the city's digital fabric, APEC's security measures attempt to restrict that too. As a precursor of things to come, it's instructive to see all this as the kind holistic informational urban planning - blurring physical and digital cities - that the academy has been rattling on for years. Here it is, folks. It's also going to be instructive to think how these powers might extend, just as the Declared Area has extended police powers in the streets - to a carefully orchestrated temporary enfeebling of the informational city. I wonder which city is the more resilient in the face of these strategies - physical or digital? 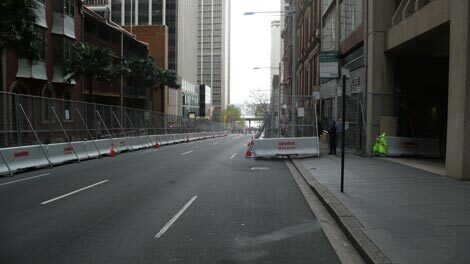 Wandering around on Wednesday, I manage to take several photos of The Fence - despite claims that people would be stopped doing so - as police close off streets, occasionally check IDs, and generally funnel people away from what are usually Sydney's busiest streets. 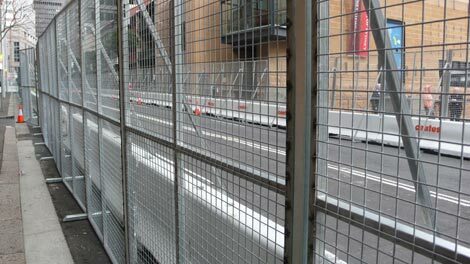 The Fence is very configurable, allowing different streets to be closed at different times. 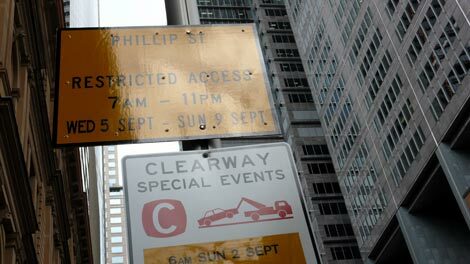 Indeed, the police occasionally seem unsure which streets to shut off, when. 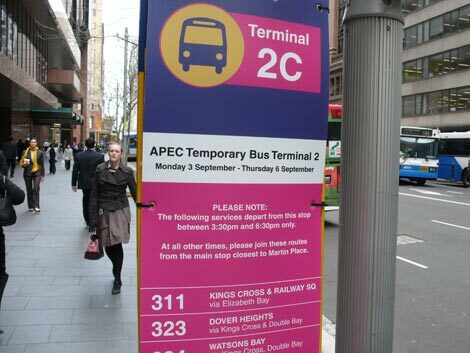 The transport services have been reconfigured too, with bus stops shifting location for APEC and indicating just how malleable the city can be. The casual militarisation of the space is clear - again recall how Archigram, Price et al were influenced by the temporary, configurable or prefabricated architecture of WWII; pillboxes, sea-forts, funnies &c. - but I also begin to see that the whole thing is working a little like a reverse of la tonnara, the traditional Italian fishing net structure, which can be seen as a kind of transient, underwater building. With la tonnara, tuna were ushered through a series of netted chambers, ultimately towards entrapment. 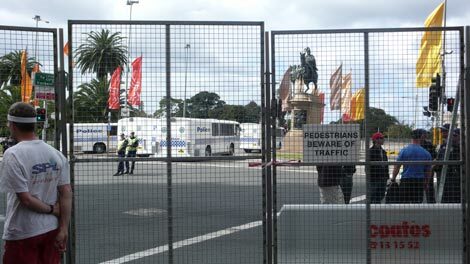 With The Fence, people are ushered through a series of steel fenced chambers, out of the city and away from APEC. It's eerily quiet, save for the constant drone of helicopters patrolling overhead. I feel a little cheated, as we were promised Black Hawks, which are an entirely beautiful if malevolent machine. 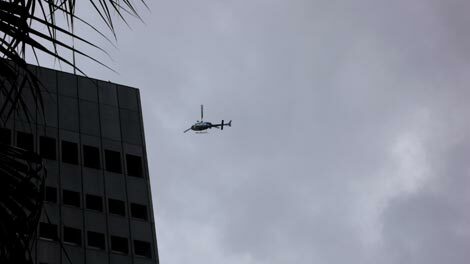 Instead we get bulbous police helicopters, sprouting with antennae. 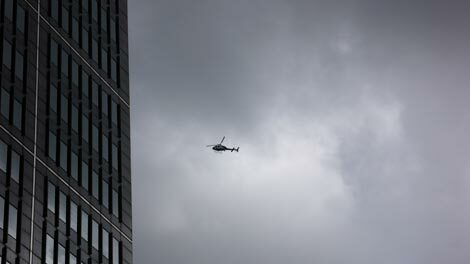 Yet their ambient drone adds a new note of threat to the city, in streets otherwise bereft of their usual soundtrack. 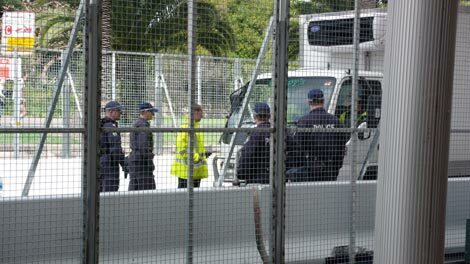 The atmosphere is a little tense - with that many armed police around, and people being corralled through metal fencing, how could it not be? - but I suspect it's far less tense that it would be in other countries. Back in sleepy Vaucluse, at the mouth of Sydney's wondrous harbour, I spot a small, grey Australian navy patrol boat, bobbing up and down in the whitecaps off the South Head. Helicopters buzz the cliffs a little more persistently than usual. Yet this seems like an empty show of force. 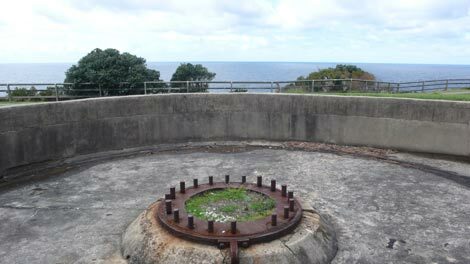 I wander past an old disused gun emplacement - looks circa WWII - with the rusted mount for an anti-aircraft gun, angled towards some imagined enemy approaching from the ocean. Any threat to Sydney now is apparently in the opposite direction, within the harbour, around the Circular Quay where modern Sydney was founded. The defences the city mounts are now internalised, covert, temporary digital or light steel structures. 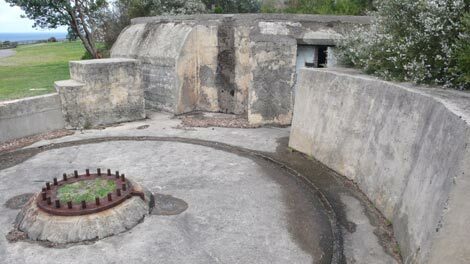 In a week or so, there'll be no trace of them, quite unlike the crumbling chunks of concrete, as if a child's discarded toys, quietly sitting up here on the raw bluff headland. 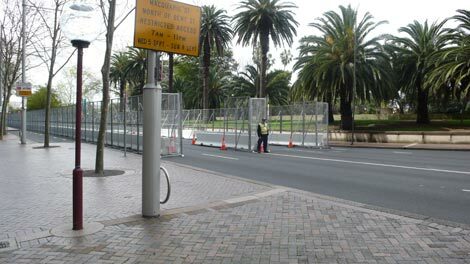 For a full set of larger images relating to the APEC fence, see cityofsound at Flickr. For more architectural perspective on walls and fences of all descriptions, check Bryan Finoki's excellent blog Subtopia. Before moving to Sydney, I'd promised myself that this site wouldn't become completely overwhelmed with notes on Australia. Yet these are precious moments, when my wide eyes are eating everything up, even more than usual. This is a rare time, first impressions hitting hard - as Dyer said of Lawrence, he would start writing about a place from the train on the way there. The active naïvety of the outsider - familiar in some of my favourite writing by Raban, Robb, Carey, Dyer - is a powerful force when well trammelled. Mark Twain said something similar. Though you never know with Mark Twain. Every day provides a cavalcade of differences, a sensation will be familiar to anyone who has lived in another country. From yoghurt pots to the layout of bus timetables to bar protocol to forms of government, and all points in-between. Even the certainties of death and taxation will be handled differently. Australia, which shares the same language as my native Britain - to some extent - and with it a strong residual cultural influence, is still utterly different. Perhaps it's more surprising as at the meniscus, the culture seems familiar, but the differences are actually fathoms deep. If you're on top of things, this is a wonderful feeling, a gently bewildering, continual mild surprise. All these subtly different experiences will ultimately tell me a lot about this place, as the dust settles. In all this, I discover a bit about local approaches to technology adoption, regulation, geography, urbanisation - and some global patterns too. As with most western economies, they're all caught on the apparent dilemma of providing both individual choice and effective public service, bobbing up and down in the often turbulent wake of Milton Friedman's work, particular interpretations of the call-and-response between government regulation and market forces. Australia has of course developed numerous iterations of its own political and economic strategies, filtered through a complex historical prism and multiplied by geography and regional aspect - it's far too detailed and subtle for me to appreciate yet. But if the reasons for things feel obscured, blurred, opaque, the differences are felt sharply nonetheless. In setting up a business, I encounter more contrasting systems - here, the importance of state-level business administration versus national taxation systems. Equally, registering for health care, opening a bank account, moving about. In terms of public transport, one has the feeling that Sydney is sort of trying them all out at once without really getting behind any of them with any vigour: bus, tram/light-rail system, an urban rail network that briefly dips underground downtown, as if trying out being a subway then quickly thinking better of it, ferries, taxis, water-taxis, even a monorail for goodness' sake. With banking, we find internet-based e-banking and contemporary financial services, but also charges on ATM transactions and in-person appointments with an actual human representative to open an account. (This latter turns out to be a more improved service, actually.) Health services are far more responsive, less under the cosh than in London. Getting a mobile, I find a far more confident, competitive and coherent 3G market than in the UK. Bolder, sharper. Alongside all the myriad benefits and improvements I see - albeit through the rose-tinted view of the newcomer - one negative difference that hits home quickly is relatively woeful broadband environment. It's a shock to feel it, coming from the UK, where the rabid competition in telecommunications has hammered everything in favour of the consumer, leading to low, low prices and relatively fast speeds. And this is something you feel; it's like suddenly carrying a lead weight. In Australia, the available speeds are much slower on average, products can be non-standard, service can be poor (connections drop without warning), the former state telco Telstra still dominates, and the deals are structured around limited data usage and bandwidth per month, rather than the flat rate 'as-much-as-you-can-eat' packages you get in the UK and elsewhere. It's only with flat rate packages i.e. consistent pricing irrespective of usage, that this technology is really freed up. Indeed, Australian housing patterns are lower density than in Seoul, but they're still highly concentrated, when viewed at a macro-level of broadband rollout and compared to the European situation. By far the majority of the population lives in the well-organised 7 coastal cities - opinion varies as to the actual proportion, from 75% to 95% of the population. Any resistance to the idea that Australia should have extremely fast broadband, competitive with its Asian neighbours, smacks of defeatism, myopia and lack of ambition. 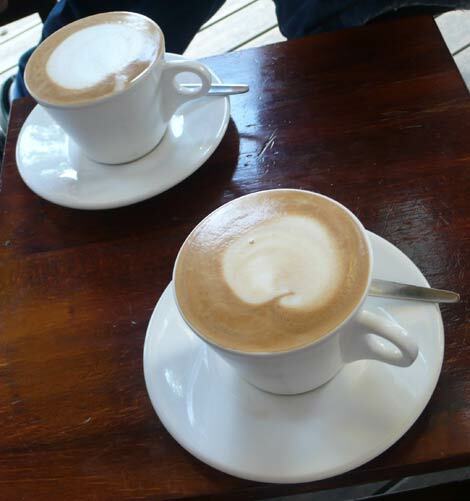 The result is an extraordinarily rich coffee culture, arguably the best in the world, with numerous fantastic cafés throughout its cities and a highly knowledgeable populace brewing at home too. It's perhaps frivolous to suggest telcos and government could look at this and learn from it, but essentially this too is a story of regulatory catalyst, technology adoption and new cultural influence through immigration to an urbanised population, wherein competition can improve quality. The ingredients may be electricity and water supply, trade routes and knowledge, and the context quite different historically and culturally, but all these facets are also the results of that 'call-and-response between government regulation and market forces' I mentioned earlier, and take strategic advantage of Australia's urban culture. Seeing broadband as a feature of a culture akin to coffee shops, rather than technical problem, may help too. Coffee shops often get used as metaphorical placeholders for the information age - not least here - but here's something that describes their genuine culture- and technology-driven evolution, through urbanisation. Equally, in terms of immigration-driven change, standing in a long, busy line at the Department for Immigration and Citizenship the other day, I was only one of a handful of immigrants who didn't appear to be South East Asian. Perhaps they will bring the broadband, as Italians brought the coffee.